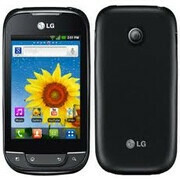 According to PocketNow, a smartphone by the name of LG Optimus Elite is to launch on Sprint and Virgin Mobile. What we are dealing with here is the U.S. version of the LG Optimus Net, which was announced back in July of 2011 alongside the LG Optimus Pro, and its presumably meant to replace the aging LG Optimus S.
However, "Elite" is probably the last word one would associate the upcoming smartphone with after checking out its specs sheet. The LG Optimus Elite has a 3.2-inch touchscreen with a resolution of 320 by 480 pixels, and inside it runs an 800MHz single-core processor. You also get a 3-megapixel auto-focus camera, NFC, and the usual connectivity features such as Wi-Fi, 3G, Bluetooth, and A-GPS. Android 2.3 Gingerbread is running the show. When it comes to pricing, we don't really know how much the LG Optimus Elite will retail for, but judging by its entry level nature, we doubt that it will burn a hole through anyone's pocket. Nothing Elite about that phone.